20th Century Art, from Cubism through to contemporary art. See also 20th century, French art of the 20th century and 20th century philosophy. 20th century art and what it became known as - Modern art, really began with Modernism in the late 19th century. Nineteenth-century movements of Post Impressionism and Art Nouveau led to the first twentieth-century art movements of Fauvism in France and Die Brücke ("The Bridge"} in Germany. Fauvism in Paris introduced heightened non-representational colour into figurative painting. Die Brücke strove for emotional Expressionism. 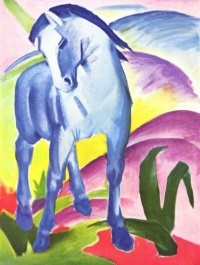 Another German group was Der Blaue Reiter ("The Blue Rider"), led by Kandinsky in Munich, who associated the blue rider image with a spiritual non-figurative mystical art of the future. Kandinsky was a pioneer of abstract (or non-representational) art. Cubism, generated by Picasso rejected the plastic norms of the Renaissance by introducing multiple perspectives into a two-dimensional image. Dadaism, with its most notable exponent, Marcel Duchamp, rejected conventional art styles altogether by exhbiting found objects, notably a urinal. Futurism incorporated the depiction of movement and machine age imagery. 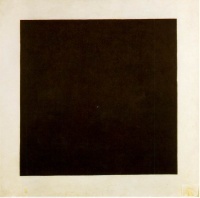 Parallel movements in Russia were Suprematism, where Kasimir Malevich also created non-representational work, notably a black canvas. Dadaism evolved into Surrealism, where the theories of Freudian psychology led to the depiction of the dream and the unconscious in art in work by Salvador Dali. Kandinsky's introduction of non-representational art led to the 1950s American Abstract Expressionist school, including Jackson Pollock, who dripped paint onto the canvas, and Mark Rothko, who created large areas of flat colour. This detachment from the world of imagery was directly challenged in the 1960s by the Pop Art movement, notably Andy Warhol, where brash commercial imagery became a Fine Art staple. Warhol also minimised the role of the artist, often employing assistants to make his work and using mechanical means of production, such as silkscreen printing. This marked a change from Modernism to Post-Modernism. Subsequent initiatives towards the end of the century were a paring down of the material of art through Minimalism and its total rejection with Conceptual art, where the idea, not the made object, was seen to be the art. The last decade of the century saw a fusion of earlier ideas in work by Jeff Koons, who made large sculptures from kitsch subjects, and in the UK, the Young British Artists, where Conceptual Art, Dada and Pop Art ideas led to Damien Hirst's exhibition of a shark in formaldehyde in a vitrine. 1980 in art - Death of Albert Kotin, Clyfford Still, Tony Smith, Graham Sutherland, Oskar Kokoschka; Pablo Picasso retrospective exhibition at the Museum of Modern Art in New York City, May 22, 1980 through September 16, 1980. The largest and most complete Picasso exhibition ever held in the United States. 1966 in art - Death of Alberto Giacometti, Hans Hofmann, The second New York City Armory Show 9 Evenings: Theatre and Engineering sponsored by E.A.T. - Experiments in Art and Technology. 1951 in art - Death of Wols, Birth of Jack Spencer, Willem de Kooning paints Woman I, the Ninth Street Show of 1951, NYC. A seminal event of Abstract Expressionism. 1913 in art - Birth of Wols, Birth of Robert Capa, Ad Reinhardt, The Armory Show opens in New York City. It displays works of artists who are to become some of the most influential painters of the early 20th century. Unless indicated otherwise, the text in this article is either based on Wikipedia article "20th-century art" or another language Wikipedia page thereof used under the terms of the GNU Free Documentation License; or on original research by Jahsonic and friends. See Art and Popular Culture's copyright notice. This page was last modified 07:51, 9 January 2015. This page has been accessed 19,178 times.